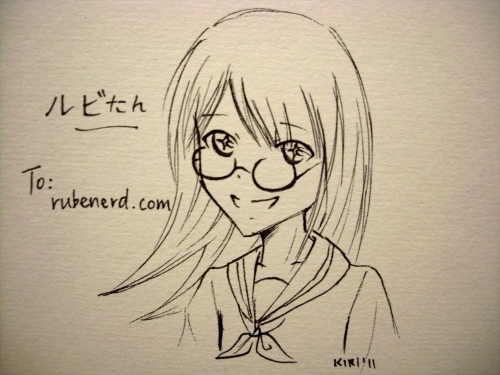 Rubenerd: The @hanezawakirika on Ruby-Tan! Since unveiling Ruby-Tan to the world early this month as the official new Rubénerd.com mascot, the outpouring of responses has been nothing short of incredible. I've had tweets from people, emails, comments on newsgroups, SMSs from people I haven't talked to in years, and even skywriting (I assume). Inevitably, if you’re going to have a mascot, you’re going to get fanart. She’s too cute not to draw. >w< I hope I did her justice. Older post → System Nuakend?